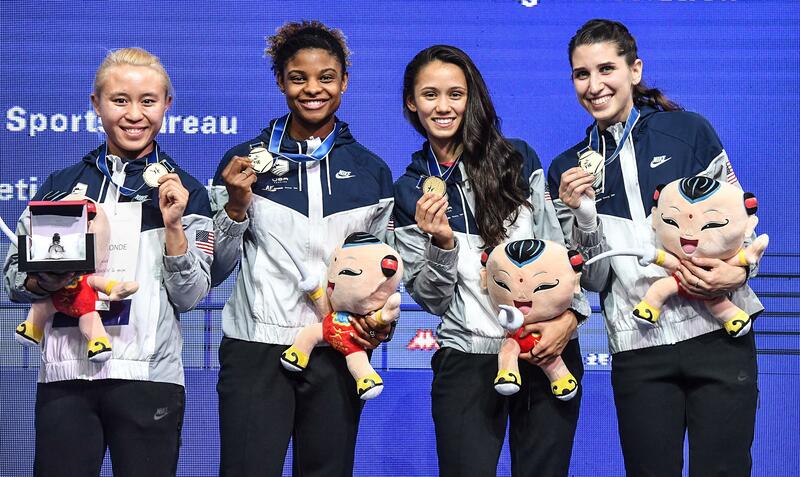 (Wuxi, China) – The U.S. Women’s Foil Team was done with silver and bronze. The squad came to China looking for gold and it would be not only their talent, but their love for their teammates that would propel them to become the first foil team in USA Fencing to win a Senior World Championship title in either the men’s or women’s events, defeating World No. 1 Italy, 45-35, in the final. The win brings Team USA's medal count for the Senior World Championships to five - tying the record set in 2015 with two events remaining in the tournament on Friday. After silver or bronze medal finishes at two World Cups during each of the last three seasons and a silver medal at the 2017 Senior World Championships, Team USA had made itself an international threat to any competitor it came across. Being Senior Worlds, however, “any competitor” was bound to be a gold medal final against Italy – the team that has won gold in four of the last five seasons and swept all five World Cup titles in 2016-17. Led by Alice Volpi who won individual gold on Monday and Arianna Errigo – the former Senior World Champion who took bronze this year – the Italian team was expected by many to return to the top of the podium yet again, but Team USA remained unfazed by their opponent’s success record. The Americans qualified for the quarter-finals on Thursday with a 45-22 victory over Spain on Wednesday as two-time Olympians Lee Kiefer (Lexington, Ky.) and Nzingha Prescod (Greenwich,Conn.) and Margaret Lu (Greenwich, Conn.) dominated nine straight bouts with each fencer contributing 15 touches to the final score. On Thursday, Team USA drew Canada in the quarter-finals and dominated the match, 45-19, with Ross contributing 19 touches and throwing down a +12 indicator. Kiefer and Prescod finished at +9 and +5, respectively, against a Canadian team that had a breakthrough season with its first Grand Prix podium in foil coming from World No. 7 Eleanor Harvey. In the semifinals, Team USA fenced a Korean team that upset World No. 2 Russia, 40-38, in the previous round. Team USA gave up just six touches in the first five bouts, building a 25-6 lead and finishing with a 45-22 victory. The squad’s anchor, Kiefer, went +11 on the match as Ross and Prescod went +9 and +3, respectively. “We were trying to bring our best game today and we did, no matter who’s in front of us,” Prescod said. In the finals, Italy led the match, 10-4, after the second before Ross changed the momentum of the match with an 8-5 win over Errigo to cut Italy’s lead to 15-12. Fencing World No. 10 Camilla Mancini (ITA) in the fourth bout, Prescod tied the score at 16 and then took four straight to win the bout, 8-1. “I was just going off Nicole’s momentum. I feel like the whole day we were just going off each other,” Prescod said. Kiefer would use that energy in the anchor bout against Volpi. Kiefer gave up just one touch to Volpi, sealing a 10-touch victory, 45-35, against Italy – a team the Americans had not beaten in competition since 2014. “We believed in each other. We had great conversations and we fenced like fire,” Kiefer said of the team’s success. For Prescod, the key was believing in themselves from start to finish. Although Kiefer just turned 24 in June, the core of the current U.S. Women’s Foil Team has been together since 2009 when Kiefer, Ross and Prescod defeated Italy to win Team USA’s first ever Junior World Championship team title in women’s foil. With Ross aging out that year, Lu joined the junior team in 2011 and the four fencers have fenced together throughout much of the last decade. Through that time, USA Fencing’s women’s foil program has reached new levels with Kiefer, Ross and Prescod earning podium finishes at World Cup and Grand Prix events and Lu being among the top eight individuals at a Grand Prix. Rather than that success as individuals dividing them, however, Ross said that it has brought them together as a team. Once teenagers trying to make their way on the senior circuit, the women of this team now have so many responsibilities to balance in life, but Prescod said it’s their love for each other and the sport that helps create success. “I think our love for each other just propels us. It’s so awesome. It’s so special,” she said. Lu, who played a key role in Team USA’s win over Spain in the opening match, echoed the sentiment. “I feel really proud and honored to be a part of this team and see these ladies fence fight so hard back-to-back all day long. They kept it so tight. They kept it so sharp. I’m so proud of how amazing they are,” she said. Coach Buckie Leach (South Bend, Ind.) has been at the helm for all three of the U.S. Women’s Foil Team’s medals at the Senior World Championships, including the silver in 2017 and bronze in 2001. The win comes after Kiefer and Prescod both earned top-eight finishes individually, missing the podium by just a few touches. “Fencing hurts so much of the time. Ninety-nine percent of the time, you’re going to feel sad and defeated and just having this victory together and for each other is going to push us on to Tokyo hungrier than ever,” Kiefer said. The U.S. Men’s Epee Team fell one touch away from the medal rounds, advancing to the quarter-finals for the first time since 2012 and pushing World No. 1 France to a near upset. Together the team pulled ahead of France, giving McDowald a 36-35 lead going into the anchor bout against Yannick Borel – the No. 1 fencer in the world who won his first individual title on Monday. McDowald fenced an excellent bout, pulling ahead to 44-42, but Borel scored two singles to put the bout into overtime. With France earning priority and a double already in the books, Borel scored the winning touch with 12 seconds on the clock. Team USA went on to fence for fifth, but lost both of its next matches, falling to Italy, 45-30, and again to China, 25-24, in overtime to finish eighth. The U.S. Men’s Foil and Women’s Saber Teams each fenced table of 16 matches to qualify for the quarter-finals on Friday. The U.S. Men’s Foil Team guaranteed a second straight Overall World Cup title with a 45-26 win over Hungary to qualify for the quarters against China. After five straight World Cup wins and a Pan American Championship title, Team USA’s top-16 win secures the end-of-season title, but Team USA has its main focus on winning gold when Alex Massialas (San Francisco, Calif.), Race Imboden (Brooklyn, N.Y.), Gerek Meinhardt (San Francisco, Calif.) and Miles Chamley-Watson (New York City, N.Y.) return to competition. Team USA took on Hong Kong in the 16, winning the bout, 45-33, to advance to the quarter-finals against Russia – the reigning Olympic Champions.